If there's one thing the early Marvels taught me, it's that exposure to seemingly lethal doses of radiation is not only good for you, it makes you ultra-powerful. Good old 'Godzilla science' in action. "Incidentally, I'm a little surprised there doesn't seem to be all that much of a nostalgic resurgence around the Roger Rabbit movie. I think it's proven itself to have a timeless quality and it still looks as extraordinarily well-made as any big-budget blockbuster I've seen." My very favorite movies as a kid were the first 2 Superman films, the Indiana Jones films and "Who framed Roger Rabbit". Off topic, but I really really loved that film. It's concept of cartoon characters existing and working in our world blew me away as a kid, and it was really well made. Got me in a mood for watching it again. I had always found Doctor Strange to be a pretty boring experience in my limited exposure to him over the years. He had some cool aspects, but more often than not, it seemed like his magic could do whatever the plot required (or *not* do what he'd done in a previous issue, because the plot required *that*). Then I read the "Essential" volume with the Lee/Ditko stories… and they're great! Especially because Stan and Steve had clearly thought through the rules of how things worked in Strange's milieu. And what's more, these "rules" were seldom if ever *articulated*, but there was a consistency to the presentation that the reader could figure them out, and seldom wondered "Hey, couldn't Doc just use his cloak to get out of this jam, like he did two months ago?" Jim, I love that list of "impossible" types of stories according to Stan (Dreams, Aliens, Other Dimensions, Magic and Mental Powers). I think I first became aware of the unique issues with telling good fantasy stories from Roger Ebert's movie reviews. I believe dream-based movies are one particular type where he's mentioned that he couldn't get involved in the story because clear rules had not been established. I would say the Star Wars movies did a better job of establishing the "powers" of their characters with clarity than the Harry Potter movies did. The Superman character and some of the crazier powers he's had in some interpretations shows how the superhero genre can fall prey to this problem as well. I guess that's why the powers-that-be decided that Superman needed to be "depowered" at one time or another. One movie that I think has been underrated as a fine example of fantasy done right is Who Framed Roger Rabbit. They did a remarkable and efficient job of establishing the "rules" of that quite far-out fantasy universe and sticking to them, so that the drama and the suspense really worked. I think they only broke their rules one time, when Eddie Valiant briefly gets flattened like a toon while in Toontown. That scene is an example of how the movie could have devolved into nonsensical zaniness if the creators got undisciplined, but in this case it stands as the exception to the rule. Incidentally, I'm a little surprised there doesn't seem to be all that much of a nostalgic resurgence around the Roger Rabbit movie. I think it's proven itself to have a timeless quality and it still looks as extraordinarily well-made as any big-budget blockbuster I've seen. I think you're right. Vaneta Rogers posted a Newsarama interview with John Rozum and Scott McDaniel about Static Shock on September 7th. She wanted them to explain how the collaboration is breaking down. Rozum described Scott as "very enthusiastic about it and has been coming up with some great ideas. And he knows a lot about science, so that's been really helpful. Dwayne was always my go-to guy whenever I had any physics questions, but Scott seems to be pretty knowledgeable about that stuff." Later on, Rozum emphasizes that "We're really making this more of a scienc-y book, so there are technology based villains and other rogues who fit with Static." I was introduced to Brian Johnson by my Dark Horse editor, the talented, skilled, smart but overworked Chris Warner, at a dinner after the NYCC two years ago. I don't know how they know each other. The most science-savvy comics creator I ever worked with, and certainly one of the smartest, was Dwayne McDuffie. If Mr. Johnson gives you permission to share the slides, great. If not, his audience got an exclusive treat! How did he discover your Dark Horse books? I hope your panel with him goes well tomorrow. I appreciate how you continue to post and comment even with this convention in your schedule. Barry Kaplan: from financial VP to second grade teacher? Whoda thunk it? I bet there's a fascinating story of self-reinvention there … even if the Elfqueen wasn't involved! Who in the world said something as absurd as Fukushima being anywhere even near on the scale of Chernobly, never mind actually being 300 times worse? I can only assume that it was some retarded newsbunny who knows almost as much on the subject as Homer Simpson. But mass hysteria must be great for ratings, I guess. Jim, who is the most 'science-savy' creator you ever worked with, who could actually sell the comic-book pseudoscience in a well though out, believable way? Thanks for checking in, Barry. Nice to hear from you. I'll bet those second graders leave your care knowing their math and how to read a balnce sheet. : ) Be well. Just decided to google myself and found your blog and articles. Thanks for the kind words. Glad to see you're still alive and kicking. I'm in my 16th (and probably last) year of teaching second grade in Parsippany, NJ. I think my years at Marvel has helped me bring comic relief to teaching. Thanks. It doesn't look like I'll be in a position to hire creators anytime in the foreseeable future, but, anyway, very good, very clever stuff! On the other hand, that's the underlying obstacle associated with using a radioactive spider. The problem isn't that nobody treats radiation seriously. It's that the public could be leery toward it having major benefits with no negative side effects. i dont know what Defiant1 and or anyone who says theres no good science fiction in current comics is talking about. thats pretty obviously not true. go read atomic robo. or hickman's FF run. or most things by warren ellis. or keiron gillen's S.W.O.R.D. or X-Men. and thats just from the relatively small about of current comics i read! or maybe provide some examples of where modern comics are using outdated sci-fi tropes. otherwise i find things to be quite the opposite of defiant1's contention. I never liked when in the new Spider-Man movies that the spider that bites Peter is 'genetically modified' somehow making the origin more modern. How lame is that? Spidey gets his powers from the technology that allows corn flakes to have a twenty year shelf life. Radiation is just as bad and scary now with Fukushima than it has ever been. The Fukushima disaster is supposedly 300x worse than Chernobyl. Infant mortality is up here in the states after declining for many years. "Cloud" computing was a goal of Oracle in the late 90's. It isn't a new concept. The price of PC's dropped so low as technology advanced that it made the marketing push near impossible. The smart phones and iPad are merely the tools which will make it happen faster. The software industry wants to store all the guts to their applications on their end and have you pay to essentially rent them. They don't want programs on your computer. They want you to own dumb terminals. Being able to do everything without them gives you too much power to cut those strings they want attached. Was watching a neat interview with Steve Jobs and Bill Gates from 2007. They were speculating on trends in the industry. They were discussing "applications" being the way information from the "cloud" was accessed. No doubt, Jobs had the iPad already under production, or was at least a goal, but the interview provided, it seemed, an opportunity for Jobs to impress Gates with the accomplishment. For people needing to make an indent on the market, requires changing the paradigm. Those changes, however, certainly have implications. To a degree, comic books have become anachronistic, but the need for meaningful content will never diminish. It's just moving to the cloud. Accessing that content then becomes the next question, and building a better "app" for doing so. 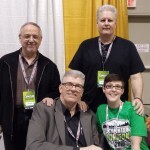 For example, how can Jim Shooter better lead his readers to his content, so that he receives residuals and other forms of income? Not rocket science, perhaps, but a better app is better than a blog or amazon or google entry. Remember, amazon or google are profiting by providing that service. Anyway, better apps. Not everybody is super-talented in making those, and it requires a fair bit of work, and is there a profit to be made, or room for speculation? What is always good is to have a test audience of, even, medium-sized mammals, and a community that is supportive. Food for thought, where science fiction and fantasy (content) meets applied science (apps). P.S. while we're at it, extra-credit for people who develop apps that raise the standard of living and quality of life for the broad spectrum of humanity. That's the bottom floor, ALL the way to the right, midway down. No sense of wonder anymore. I read old comics abot 30 to 1 to new comics. New comics are all about the character drama with little regard to plot. And the only new ideas at Marvel or DC deal with stretching out mega-stories over so many issues that it's so thin you can't even tell what the story was. The only "wow" I experience anymore is to the negative. Definitely not very much in the way of imagination in the stories. Even the worst hacked-out story that involved Jack Kirby or Julius Schwartz always gave me something fascinating to think about. At least they tried to push the limits of readers' minds–instead of just pushing the limits of their patience, and wallets. Jim, Mr. Shooter, the next time you're in the position to hire, I want in. I feel the same way about comics that you do. Stan used to say (jokingly) that there were five kinds of stories that couldn't be done: Dreams, Aliens, Other Dimensions, Magic and Mental Powers. Why? Because the Aliens' ray guns can do anything the writer says, and therefore no real drama can be generated. If Zatanna can do anything by saying it backwards, why isn't the story over on page two? Etc. Then he'd talk about how to do them — establish the rules, lay down the governing logic and stick to it. You are absolutely correct. Fantasy writing requires much more discipline and skill. Here's a short interview Brian David Johnson did with Chris Warner of Dark Horse in San Diego last year. They talked about how the comic industry has changed in the last 20 years, a topic that's right up our alley. Here's Brian's Twitter account. My opinion on science-fiction vs. science fantasy is that it's all good, just give me something new. Or at least offer a genuinely new spin on the old stuff. I am a little warier of fantasy because I want to read a plot where I understand the rules of the game. Too often every turn of the plot in fantasy seems like a deus ex machina, something that I could never have predicted would happen because the boundaries of the universe weren't established. Science-fiction at least compels the author to explain a whole lot more upfront to establish his universe. I think fantasy can work just as well, but the writer needs to try harder to show more discipline. They need to establish a set of rules about how their universe operates and stick to it. Warren Ellis' Iron Man Vol 1: Extremis was the last thing from ether of the big 2 comics publishers that had science as an important pat of the story and was used in a unique and imaginative way that furthered the story and gave it layers and even deepened Stark's character all while having me the reader going "Wow! That's cool!". I've used old characters like Solar, Magnus, et al, because those were the gigs offered to me. But I try to come up with new villains, new concepts, new ways to use the old things as much as I can. I'm sure there are other comics writers who do science-based stuff, but offhand I can't name one. 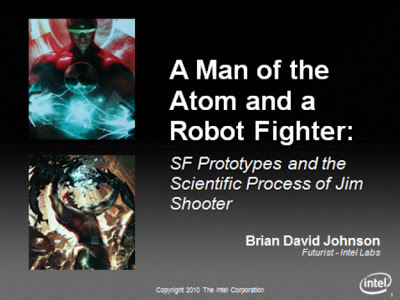 I have all the slides from the University of Washington lecture by Brian David Johnson. I'll ask him if I can show them. I think there are two factors behind the lack of new science ideas in American comics. First, the technorace with the Soviet Union is over. (The Soviet Union itself is over!) Science (not necessarily very accurate) used to permeate pop culture to the point where even Stan Lee — who was primarily writing Westerns and humor comics — embraced it. Now science seems to be a backdrop for The Big Bang Theory. Ironically, high tech has become an even bigger part of our lives. So big that most of us just take it for granted. Second, as you pointed out, "Comic books have become like opera. You go to see a particular performance of an old story, not a new story." Fans want to see the same old heroes and villains forever. So what was cutting edge in the 60s has become frozen in time. Although you use old characters, you incorporate new science into them as well as into your new characters. Can you and/or your readers mention other examples of cutting-edge science incorporated into current comics? You first come to mind when I think of comics writers with a science background. Are there others? I wish I could have listened to that University of Washington lecture about your work! I don't see anything wrong with science fantasy. I mean its all bull plop in the end.